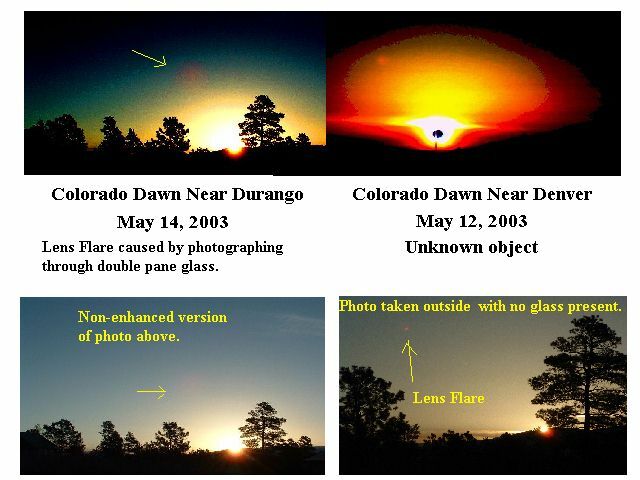 As a courtesy, I wanted to see if I could duplicate the May 12th Colorado dawn photo. I took a series of photos at the same time from my area in Colorado this day, May 14th. I saw nothing visually. The photos were taken both inside and outside over a period of about 20 minutes. Once displayed from the digital camera an object appears at the same angle as the May 12th photo. The outside shots are abvious lens flares as they have indistinct rainbow-like shapes and color. The shot taken inside through a double pane glass window however had a rather dramatic effect. A circular redish flare in the same position. There is a qualitative diference from the May 12th photo but I wonder if the photographer in Denver also took a photo through a glass window, perhaps single pane glass. I still do not know if Planet X is there or not but an open mind will investigate all data posibilities no matter where they might lead. I hope this comparison will assist others in determining what they see. I shot the pictures from outside in the same position 3 days in a row. I've had trouble getting some repeatability in the pictures so I sent a series of them to Steve. Do we think we might be getting some sort of lens effect?